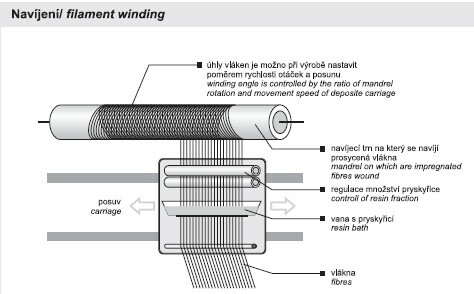 By filament winding technology the reinforcement, usually glass but also carbon or aramid rovings impregnated with resin are wound onto mandrel having the form of the final product. Using this technology it is possible to manufacture hollow composite products – tubes, tanks and vessels of various size even of changing form. The motion of laying arm along the lengthwise axis by contemporaneous mandrel rotation and the position of laying eye enable the precise laying of fibres and allow to produce even relatively complex parts. Filament winding process is fully controlled by computer. Reinforcement obtains by special equipment located on the roving creel the certain prestress what makes easier the exact placing on the mandrel. Winding angle is controlled by the ratio of mandrel rotation and movement speed of deposit carriage within 90° (circumferential winding) over cross winding with various angles up to 0°, for instance axis reinforcement of drive shafts and tubes. Thanks to dismantle and removable mandrels it is possible to gain by so called integral winding the complete vessels inclusive bottoms and spherical caps only with small polar outlets. Reinforcements: Mostly rovings – glass roving with various tex, for more sophisticated applications also carbon tows. Nowadays is also used special roving Twintex (Vetrotex), which consists of glass and thermoplastic fibres. Beyond the direct glass roving it is possible to use special light-weight roving Spheretex based on glass, carbon or aramid fibres with incorporated expanded thermoplastic microbubbles. Resins: Polyester resins of various types, vinylester and epoxy resins. Postcuring by elevated temperature is necessary when use the filament wound tanks for storage of foodstuffs or drinking water to reach the maximum curing degree and to obtain the rest styrene level as low as possible. Filament winding is one of most progressive method for manufacturing of hollow composite parts. Investment cost is given by the value of winding equipment and by the cost of mandrels. Tubes with diameter from 150 to 3000 mm and tanks of 1 to 100 m3 volume are currently produced.